Today the work on our house officially began! 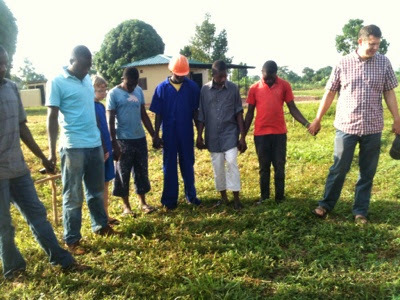 This morning we met at the site and had a brief time of prayer. Daniel Iya, an engineer overseeing this project shared some thoughts. He mentioned that our primary goal is to make disciples in the process of building this house. He will lead times of prayer and reading God's Word with all the workers. I am excited that building our house will provide the opportunity for many Ugandans to have work to provide for their families and opportunities to hear the gospel! 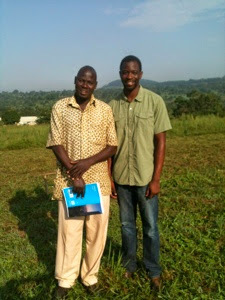 Please pray for Daniel and Joseph, the foreman on the job, as they oversee the work, but also seek to make disciples. Here is a photo of these two men. Joseph is on the left and Daniel is on the right. They are standing where we are beginning to work today! As we all stood there Daniel shared this verse. "Unless The Lord builds the house, those who build it labor in vain." Psalm 127:1a So we began this project asking God to not only provide for our physical house, but that he would use this project to build his kingdom. Please pray with us! We are so grateful for the many of you who are partnering with us to make this house possible. I will keep you posted as the work progresses. It is our hope and prayer to be able to move in early in 2015.